Joseph Colbourne has this to say “A moderately viscous material of bright orange color, this solvent-extracted Jasmine absolute from Egypt has a dynamic olfactory profile. Voluptuous, heady white floral top notes are commanding and seductive, the scented equivalent of crushed velvet, opulence, the Queen of Sheba. Only mildly indolic, this absolute has more spicy facets—cinnamic and subtly clove-like undertones. Its dry down reveals soft impressions of tropical fruits and tea leaves. 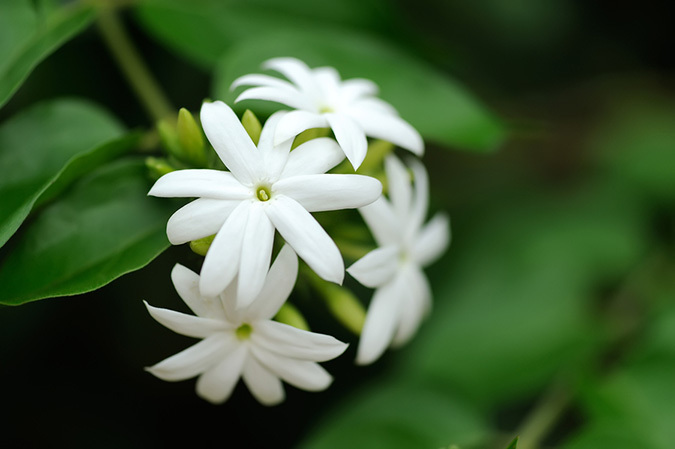 Jasminum is a genus of over 200 species of deciduous climbers and evergreen shrubs, most of which are tropical. The fragrant flowers of jasminum species consist of anywhere from 4 to 9 petals and are flat or tubular shaped.This material is red-brown in colour, of a pourable viscosity and is produced by solvent extracting the Egyptian concrete of jasminum officinale. Safety Data: Within the normal therapeutic guidelines this material is safe. Some therapists note that they get headaches when they use jasmine absolute, possibly because of its benzyl acetate content. There is no reason connected with safety data why dilutions less than 3% should be used, however, due to the incredible strength of the absolute, a 1% dilution is more than adequate.